These files should work for the changes in Beta for profit. I cannot log in and actually test them so please note any problems in this thread. These are for the guild window and the persona window. EDIT: Files attached lower in thread. Last edited by TalTal : 10-18-2018 at 06:27 AM. Just thought I would tell you about the new mount equipment page. This is a snip of the main mount page. If you look at the bottom, you have "bleedthrough" with the new equipment page. The text, saddle icon, and frame should align. This only happens each time you login to game. 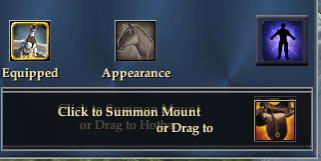 When you click on an icon in the mount page. It disappears. I had this problem with Drums as well. Since you are not in beta I can fix it if you want. Last edited by Blackhood : 10-11-2018 at 08:24 PM. Here is the file with the fixes. Last edited by Blackhood : 10-12-2018 at 07:47 PM. It looks like they updated the guild window. The above linked filed isn't working and I get an error message. Try this one. I forgot to update the file version number. Edit: Attachment removed. New file further in thread. Last edited by TalTal : 10-21-2018 at 07:38 PM. I'm getting an error in Beta when I try to log in using this one. It says this is the wring Guild file, yadda yadda. I'm attaching the Beta default guild window, so you have it for reference. Last edited by TalTal : 10-27-2018 at 12:11 PM. Try this version. I made a minor change, hopefully it allows it to work. Thank you for that. I can get the beta files though. I just can't log in to beta to test changes. So I'm just differencing the files and making what looks like appropriate changes.